With the month graph you can see how much time you worked on different task categories and projects in a specific month. This window stays always the top window ,you can use other windows when this window is active such as the main window and the “Remind Me” window. 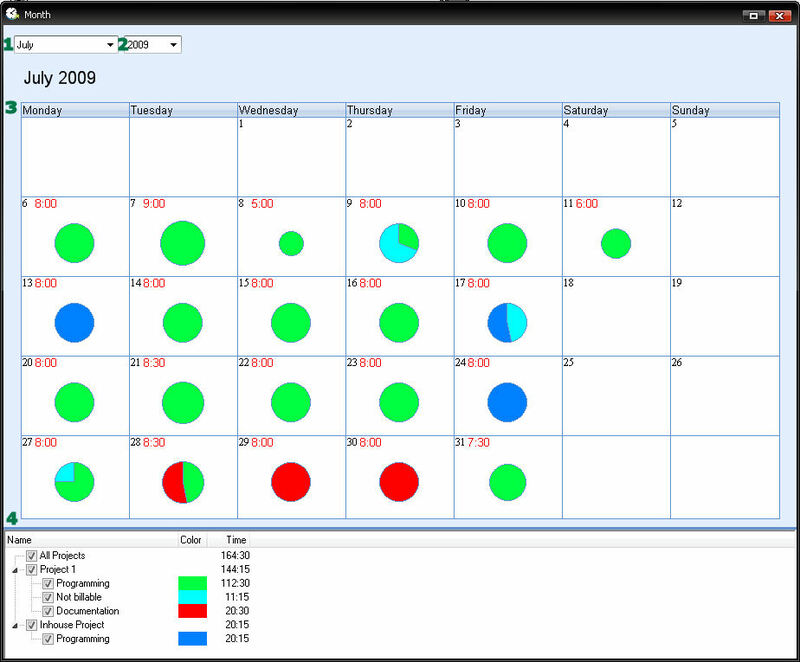 The task categories are presented in pie charts on the different days. The month that is visible. The year that is visible. A graph where all the days of the selected month are visible. Within each day the task categories are visible in a pie chart . The size of the pie chart size represent the total amount of hours, so if you work from 9 till 5 and you worked 8 hours on specific day this will be represented as a circle that fills the whole day,but when you worked only a half hour on a specific day this will be represented as a small circle. Here the project and task categories are visible with the color of the task categories and the time that was spent on this item in this month. Here also a project or task category can be selected/deselected so that it doesn’t show up in the month graph and that time doesn’t appear in the legend.